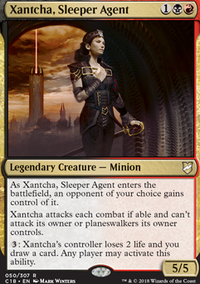 Blind Obedience is a great card. It's use is to slow opponents down. But the most important part is, that their creatures enters the battlefield tapped, so we can get better attacks wirh our creatures. That beeing sad, Cover of Darkness fullfills the role of enable better attacks way better, especially, since I'm the only player in our meta which is playing black decks at a regular bases. The Phyrexian Reclamation doens't need a specific condition in order to work. Oversold Cemetery on the other hand has a huge advantage, that we neither have to pay life nor mana in order to return a creature card to your hand. We just will get one for free each round. Since we will attack with many of your creatures, there also should be at least four in the graveyard, most of the time, too. 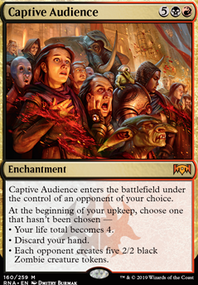 We won't be able to play tons of creatures each turn anyway, so the advantage of multiple uses of Phyrexian Reclamation per round won't come into play that much. 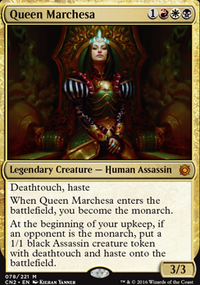 Even though Outpost Siege has two great modes for this deck, since we are playing Mardu as colour combination, we will use it's first mod to net ourselfs some cards in 9 out of 10 situations. Just to get that little more Card Draw or better Card Advantage. But if we looking for just raw Card Advantage, we should use black instead of red cards. Greed can get us way more cards then Outpost Siege , it's even kind of a weak Necropotence , which is one of the strongest cards in the deck I think. 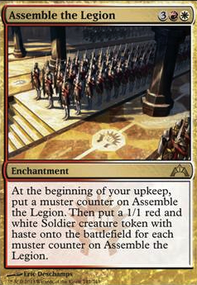 Although, Austere Command cost one wanky mana more then Fell the Mighty , it's way better. While Fell the Mighty might be really helpful with clearing the field from creatures and letting us decide, which one will survive, Austere Command gives us way mire flexibility. 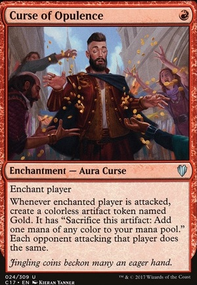 Destroying all enchantments and artifacts is huge in Mardu colours. 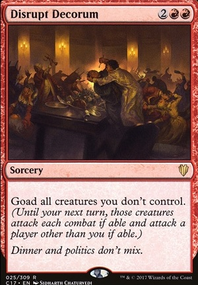 Combining it on a general Boardwipe card is also a big deal, because we want to run as less cards as possible for those slots in order to be able to have as many Vampires in our deck as possible. I love Disrupt Decorum , I really do. It's such a cool card. But it's like a Sudo-Boardwipe, which won't solve all problems for sure and has a one-time-only usage in this deck. It's main purpose always was to create some chaos arround the deck. Reconnaissance can do the same trick, but with incredible more power. It makes blocking for our enemys really awkward, since we can remove any creatures we want after blockers are declared. We can attack all out and then remove the Vampires which would die from blocking. And after damage is dealed, we can remove all the other vampires aswell, giving our whole board Sudo-Vigilance. No worrys about keeping blockers up ever again, if Reconnaissance manages to hit the field. Until now, Throne of the God-Pharaoh never was able to shine or deal even any true amount of damage at all. The biggest problem is, that opponents usually block as many Vampires as possible anyway and trying to kill them during that process. Therefore, at the end of our turn, there are usually less Vampires then at the beginnig. That's why I feel like Edgar isn't the right deck for Throne of the God-Pharaoh yet. Maybe I have to re-test it in the futrue, but I will swap it out for now. Sorin, Solemn Visitor can give us plenty of life to pay those (new) card draw engine spells. It also buffs our creatures. And puts more Vampires on the battlefield. And keeps decimating our opponents boards. Yeah. Just play him! The use of Legion's Landing Flip is really little to none. Most of the time, it's just a utility land and I barely get to use it's effect at all. Creating just one or two more little small tokens isn't that impactfull either. It was kind of interesting because of the lifelink, since it's one of the only ways, to stay healthy during a long drawn out battle between three or four players around the table. For this exact reason, Exquisite Blood will make a return. Since the Vampires really looking forward to keep punching our enemys, we will get some life back, for sure. Disrupt Decorum seems decent for this deck, it would allow you to attack without fear. Not sure how you feel about it, but Painful Quandary is a cool card. First thing first I hate to be that guy but, your commander would be better off being Kiki-Jiki, Mirror Breaker or Feldon of the Third Path . Now I kinda hope you ignore that suggestion though. My best suggestion is Sundial of the Infinite This turns anything temporary into something permanent. Exile at end of turn become "keep forever". Steal until end of turn becomes "Keep Forever". Anything that ruins your turn like cyclonic rift counter it with sundial. Draw: Mono red is difficult to come across draw you usually either have to wheel or rely on artifacts here are a few of my favorites. Steal: Red does not have a lot of good removal but it's great at stealing stuff. My favorite strategy is steal and then kill whatever you stole by sacrificing it. 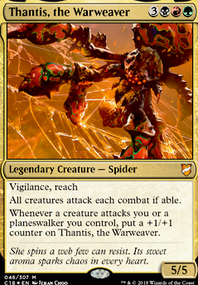 Zealous Conscripts Goes infinite Kiki or Splinter twin also great with blade of selves removing the biggest threat. Copy & Tokens: cards that can create copies of your stuff. Blade of Selves Create 3 tokens instead of just one and can repeat. Mirror March not yet released but keep your eyes on it. Life & Fight & Death: Great creatures for you to copy. Fellwar Stone Better then a few of the rocks you have. Generator Servant Ruthlessly stolen from Suns_Champion just imagine calling out a malignus with haste. Have fun going through and choosing stuff from the list and worst part of all cuts in your own deck.